After months of speculation and a will-they-won’t-they game of leaked and delayed release dates, Nvidia look set to finally reveal all about their upcoming Nvidia RTX cards this August. There’s a chance we may hear about them formally beforehand, of course, especially if the current rumours about a GTX 1180 Founders Edition appearing next month are to be believed, but whatever happens, the program outline for this year’s Hot Chips conference suggests we’ll definitely be hearing at least something about what’s in store on August 20.Hop over to the full program for Day One of the Hot Chips conference, for instance, and you’ll see Nvidia’s Stuart Oberman is due to take the stage at California’s Flint Center for the Performing Arts at 11.30am to talk about “Nvidia’s Next Generation Mainstream GPU”. There’s not a lot else to go on, admittedly, but this is the first time we’ve seen something set in stone from a reliable, credible source that actually exists and definitely hasn’t been pulled out of the ether from a nebulous cloud of anonymous nonsense. Now, Hot Chips is a conference that typically focuses on high performance hardware. But the fact Nvidia’s talk specifies they’ll be talking about their next ‘mainstream’ GPU suggests we’ll almost certainly be on track for more details about their 11-series Turing cards, such as the GTX 1180 and GTX 1170, rather than their more businessy-orientated GPUs, which are currently going under the code name Ampere. 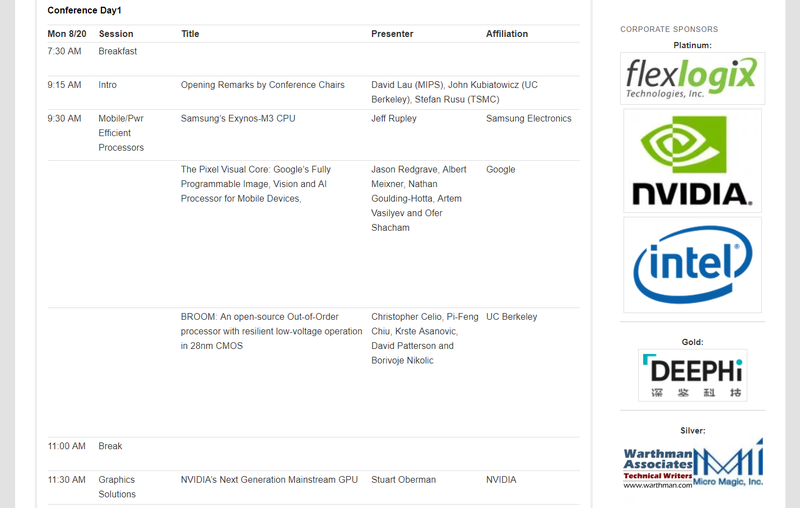 Nvidia’s Stuart Oberman is due to take the stage at 11.30am on August 20. Click to expand. At the moment, most of today’s release date rumours are still pointing toward an autumn release date for Nvidia’s Turing cards, and given the timing of the Hot Chips conference, it’s possible this may still be the case. Talk about what’s in store first, and then launch them shortly afterwards. That’s how these things tend to go. And yet, there’s that small issue of that supposed Founders Edition appearing next month. Of course, there’s nothing stopping Nvidia from launching the Founders Edition first, then going to Hot Chips to talk about the wider Turing family before launching the rest of their consumer cards alongside a proper third-party release a month or two later. Both options sound equally plausible. Only time will tell, of course, but at least we’ve finally got one date that actually means something. So mark it down in your calendars, folks. It’s going to be a fun few months.